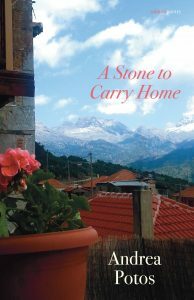 A Stone to Carry Home, Andrea Potos’s seventh poetry collection, is the perfect read for mothers seeing children off to college this fall. Although the airy, Mediterranean cover photo might suggest that these poems will be songs of travel, the journey on which Potos takes us is more interior and temporal than it is geographical. Yes, Potos gives us the flavor of Greece—the red wine, the dark coffee, “the slicing and the frying, / the olive oil, lemon and thyme” (38)—but she also gives us the flavor of worry, anger, and aging. She gives us the violence of loss and the bitter-sweetness of tenuous reclamation. Potos captures the complex feeling of being both left behind and pushed ahead as time marches on. In the second section, Potos and her newly adult daughter take a trip to Greece, a spring break escape that is also a search for their heritage. Before we get there, however, Potos takes us to Haworth to meet the Brontës and to Emily Dickinson’s grave in Amherst, implying that these women are as much a part of her heritage as the Greek grandfather whose ruined house provides the titular stone to carry home. If we want to know people, even the dead, being where they are or have been is crucial: “You have no choice but to travel, remove time / from time, go with your self” (31). She continues this theme after Greece, visiting Van Gough’s bedroom and Les Deux Magots, a Parisian gathering place for a generation of artists, thinkers and, of most interest to Potos, a timeless staff of uniquely professional waiters. Yet, Potos’s brief sojourn in Greece seems more important after the fact than in the moment. Of forty-two poems in the book, only six take place in Greece; an equal number explicitly recall her being there and explore the effects of that experience. After Greece, Potos finds its beauty in her sleep; she finds it easier to replace the weight of the future with memories of tranquility; she is more inclined to trust her daughter’s happiness so that her own “stalking heart” can return home (45); and, of course, she is full of new inspiration for her writing: “The words are already drafted / from another air” (46). The final two poems, “After a Transcontinental Trip” and “Lines Lifted From a Travel Journal” are both immensely satisfying, as Potos shows us travel, for all its rigors, as a means of rekindling, a way of seeing home space with new eyes, an opportunity to bring worlds vibrantly together. The spell of the journey does not dissipate with homecoming; rather, it reorients the traveler. Potos’s early focus on loss gives way to a focus on gain, and she has gained enough to give. Potos has won a number of awards for her poetry, and its appeal is clear. She makes verse accessible with brevity, clarity, honest emotion, and one strong conclusion after another. This collection is seeded with simple recurring elements—water, bread, coffee, singing, stones, blue, red, yellow—that grow together in significance, making the poet’s world both more expansive and more intimate. The reach of this network includes the reader, and after we’ve felt gold “penetrating each cotton pore” of Yaya’s flapping laundry (42) and warmth burning through the glass of a coffee shop window, we, too, must feel emphatically that “even against pressing darkness: / There is a sun” (43). Libby Maxey is a senior editor with the online journal Literary Mama. She reviews poetry for Mom Egg Review and Solstice, and her own poems have appeared in MER, The Fourth River, Crannóg, Kestrel, and elsewhere. Her nonliterary activities include singing classical repertoire and mothering two sons.